As its now been some time since I wrote my original piece for Tubeprune, I thought it might be of interest for readers to see what the day-to-day life of a driver is like. What follows is a bit of an insight into what we do, when and why and how the various shifts work. Well, thats actually not quite accurate as no two duties are the same, so what Ill do is try to give you a feel for what occurs at different times during the day, depending on the shift being worked. Its worth remembering that London Underground trains start running at about 05:15 in the morning and that the working day continues until about 01:30 the following morning, so a drivers shift falls somewhere in this period. If a driver follows his own rota hell do one week of early turns (these are where you book on from anything between 0445 until about 1200) and one week of late turns (starting from about 1300 onwards). The longest shifts are eight and a half hours (including a thirty minute meal break) but there are some shorter turns too. Our working week is thirty-five hours (average) and you work five days out of seven. The work period is from Sunday to the following Saturday. Rest Days (non-working days) vary. Sometimes you get two together, some are split and occasionally you get four together, two from one week and two from the next all in one spell. In fact, most working weeks are about thirty-six and a half hours. These extra hours are accumulated and additional annual leave days are allowed for this over a twelve-month period. At first this all seems very complex and confusing, but it doesnt take too long to get into the swing of it. Each duty is unique and books on at slightly different times. Allowance is made for time to book on, to check current notices and then to be in position to pick up your train at the appointed time. If youre bringing a train into service from a depot, the times also allow for you to walk into the depot and carry out the various pre-service checks before the train enters passenger service. Similarly, if youre doing lates and stabling a train at the end of the day they also allow time for walking out of the depot. All through the day, some drivers are rostered as Spares. This essentially means that you dont have an allocated duty as such, but are there to cover unexpected absences, uncovered duties, late running and so on. There are also a few night duties, but nights dont come round too often - about every thirty-five weeks or so and theyre a sort of mix of lates and earlys. Its an accepted practice that drivers can swap duties between themselves. For example, some drivers prefer all early turns, some prefer all late turns. Some depots even have people who run a system of trading duties - a sort of pool system (known within London Underground as a Mafia). At my depot we dont have this, so some drivers have a regular changeover (where they simply do each others duties on the opposite rota) but some spend a lot of their spare time contacting other drivers to swap duties around. Personally, I just follow the roster. As far as Im concerned, earlys and lates each have their own advantages and disadvantages and by doing this I know (or can quickly work out) what Ill be working months in advance and when Ill be on rest days. I dont like nights though (some drivers do) and these are the only turns Ill try to get rid of. Ill occasionally change duties with one of my friends if they need a particular rest day, or an earlier or later finish (for example) - and theyll then do the same for me if I need a similar change for a particular reason. In addition to all this, each depot has (or should have) a pool of drivers who are often new to the depot and are not on the roster. They will only find out on a Thursday what they will be working the following week. They are assigned their duties but they have the flexibility to request rest days (within reason) and to request early or late turns. But most are just waiting for a vacant slot on the roster. In principal, thats how it works. With me so far? Good. To try to put all this into some sort of perspective, Ill use a couple of duties as an example - one early, one late. This is a typical train crew duty as usually posted. The duty shown here is the second duty of the day at Acton Town (District - there is a Piccadilly depot there too). The first number (3) indicates its an Acton duty and the next two (in this case 02) show its the second duty on the book. So what does that all tell me? Well, its just really a summary of when and where the duty starts and finishes, what trains youll be handling, where theyre due to go and when theyre due to arrive and depart from the various destinations. Additionally, it tells when and where youll be relieved for your meal break, then when and where you pick up after your break and also where you finish your duty and at what time. Before going into detail its worth translating the abbreviations: - ECDT.E - Ealing Common depot and the final E tells the train will depart eastbound towards Acton Town. H.ST is High Street Kensington; EAL - Ealing Broadway; UPM - Upminster, ECT.W - Earls Court, the W indicating the westbound platforms; ECT.E - Earls Court, the E indicating the eastbound platforms. So, this particular duty books on at 04:48 and the first train is due to depart from the depot at 05:12. This seems quite a generous time, but remember the driver has to walk into the depot and prepare the train for service before it goes out. You cant just jump into a train which no one is handing over to you; you need to make sure its fit for service. As I said, its really pre-service checks - seeing that everythings working as it should and is set up properly. The checks are relatively straight forward and every driver has his own routine for carrying them out. Some checks are mandatory and must be signed off in the train log to certify that theyve been done. These mainly relate to the braking system checks. At the rear panel I am just checking that the various switches are correctly set and that the cab heating is where I want it for the time of day and season. On the panel next to drivers desk containing the PA handset (is it working?) and saloon lights (are they on? ), I will trip out (switch off) the MAs (Motor Alternators) and Overloads (the devices which pass the current to the motors) and reset (switch on) those. Is the Pilot Light (which indicates the doors are closed) lit? If its not its probably because the cab door at the other end of the train has been left open and I wont be able to finish all my checks at this end until Ive gone to the other end of the train. This panel also has the train radio control. Theres no test for this but youll soon here the depot calling other trains, or you, when its time to depart. On the desk itself, I check the wipers and whistle are working and that the air pressure gauge is reading within normal limits. I then put the Yale type key (known as the RKL 220 key) into the selector switch and select the normal position - in this case this is FOR2 (this allows the train to move) and make sure the CTBC (Combined Traction Brake Controller) is in its normal position for the brake test (SERVICE 1). Next I move to the TMS (Train Monitoring System) unit. This piece of equipment does exactly what it says and draws the attention of the driver to any faults or defects mainly by a light illuminating and an audible alert sounding. 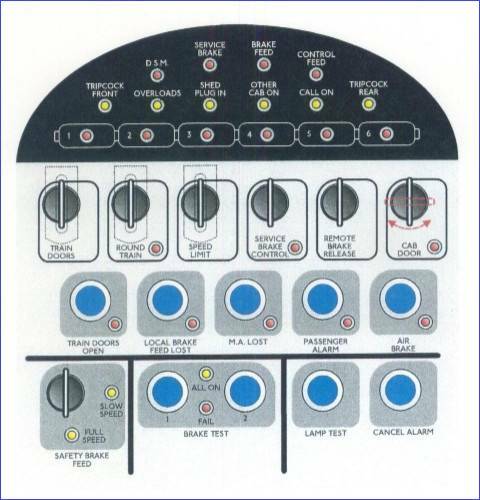 The various rotary switches allow a large number of faults and defects to be either rectified or overcome from the cab, thus (in theory) allowing a driver to get a defective train moving again fairly quickly. Firstly I operate the Lamp Test button. This does just that - when pressed all the lights should illuminate and the audible warning sounds. Next is the Brake test. This is done using various combinations of the Safety Brake Feed switch and the buttons on the Brake Test panel. If all is as it should be, I can sign off the train log. As I do this I also have a quick look to see if any past niggles have been recorded - they can act as a warning that there may be some minor fault. Now its on to the left hand side. Are the Weak Field and Coasting Control switches set correctly? The left hand side panel - is the Heat and Vent control cut in (it should be, irrespective of the weather, as its thermostatically controlled), are the MA lights lit - if theyre not the MAs are either tripped or the train is not drawing current. I operate the Passenger Alarm test to make sure thats sounding. Next I carry out a Traction Test - this allows you to make sure that the trains motors are delivering movement. Finally I operate the CSDE (Correct Side Door Enable) override and check that the doors on both sides of the train open and close correctly. And finally I check the door panel on the back bulkhead and the MCB (Miniature Circuit Breaker) panel to make sure theyre all set correctly. And then you head off to the other end of the train to do it all again. So, back to the front of the train and wait for the depot shunter to call you down to leave the depot. While waiting I usually do a few bits like put my Hi-Vi back in my bag and prepare my mug to make a coffee at either Ealing Broadway or Acton Town, depending on which direction Ill be going. When the shunter does call, youll follow his instructions, depending on where in the depot you are but in all cases you will arrive at an outlet signal. This is a shunt signal which also confirms the route thats been set for you and is operated from the Signal Centre at Earls Court (for Ealing Common Depot). When the signal operator is ready for you to depart the signal clears and away you go. At this point the train radio automatically switches from the depot channel to the line channel. So finally youre in service. All that seems pretty complex and it all happens in less than half an hour. In fact, if you develop a routine (and what Ive described is mine - each driver has his own variations) it can all be done with time to spare. This is reasonably self-explanatory and is the part of the duty that the travelling public sees. But there are a number of things that, I suppose, passengers either just take for granted or are not aware of. The obvious ones are being watchful at stations - allowing enough time for passengers to safely board or leave the train, whilst keeping the dwell time down to a minimum. At stations where passengers can cross the platform from one train to another (like at Acton Town, Hammersmith, Barons Court and Earls Court - and these are just a few) we should try to watch for trains arriving on the adjacent platform, so that they can change trains. This isnt always easy. At some places you have a very restricted view of the adjacent platform and its easy to miss a train pulling in. I know that sounds odd, but its true. Most of the time you focus on the mirrors or monitors and they do not give a view across the platform and, if the platform has a curve (such as at Acton Town), this makes the situation even worse. You have to watch your route. That may sound obvious but its easy for a signal operator to give you a wrong route (particularly at somewhere like Earls Court where the options are many), so you need to be vigilant to look for these errors. If youre not you can end up going the wrong way and that displeases many (and not just passengers). Story here.
. I once had a driver from one of the TOCs in my cab and he was amazed not only at the number of signals that we have but also how often you see the tail lights of the train ahead. You should do appropriate Public Address announcements, not only at stations but also if youre held between stations for more than two minutes you should keep the passengers informed. There are a few other things to do - listening out for radio calls, looking for persons about the track, watching out for any hazards, temporary speed restrictions and many more. Perhaps the odd signal failure or other service disruption can creep into the equation as well. So in the example of this duty you have to keep up this level of concentration for about three and a half hours and thats only the first half. So thats an early turn. These are really pretty much the reverse of the above, in that you will pick up trains in service and, often, end the day by stabling the train back into the depot. The following is fairly typical for a Dead Late. The duty starts at 1701 and finishes at 0113 the next morning, involves running two trains around and finishing the day by stabling the train back into Ealing Common Depot. The difference is that stabling a train has its own responsibilities. When withdrawing a train from service its the drivers responsibility to ensure that all the passengers are off the train. This is done by physically checking each car and making sure its clear of passengers. This can have its own problems if someones fallen asleep and are at the wrong end of the line and theres no more trains back. Theyre often angry (with themselves, I suppose) but take it out on you - you need to develop a thick skin for occasions such as this. But (eventually!) youll persuade them off the train, get all the doors closed and then wait for the signal to clear so that you can make your way towards the depot. Although this is all timetabled too, it doesnt always quite go according to the book. Its quite common to move up slowly from signal to signal, while trains ahead make their way into the depot and perhaps with a few Piccadilly Line trains making their way to and from Rayners Lane. Finally you arrive at the inlet signal to the depot. When the points clear a route indicator tells whether youre being directed onto one of the two reception roads (in which case you follow the signals) or onto one of the stabling roads, either inside or outside the sheds. If the latter is the case the duty shunter will give you a green light and indicate where youre going. You proceed as directed, stop the train in the appropriate place, shut the train down and thats it. This is a term that you may have heard and one that often leaves people puzzled. A Spare duty is where you dont have any trains rostered to you. You book on for duty at the appointed time and place and then run as directed. The duty also has a book off time, so you will do as much (or as little!) as the Duty Managers give you. This can vary a lot. If there is an unexpected absence (through illness for example) and the uncovered duty falls within your duty times, you may be given the whole turn and perhaps run right up to your time. On the other hand, if there is a full book (i.e. no duties uncovered) you may just be used to cover things such as short meal breaks or PNRs. This is a Physical Needs Relief. The driver needs to use the toilet and rather than just leave the train in the platform, a Spare may take it (say) from Earls Court to Wimbledon and back, where the original driver will take the train over again. Some Spare turns end up being a mix of both. But what every driver hopes for is that hell get to cut away early, that is finish before their appointed time. It doesnt often happen but when it does its a bonus. As an example, I recently had a spare turn that was due to book on at about 1515 - the duty was due to finish at about 2345. I arrived early (as I usually do) at about 1445. Within ten minutes it was clear that a driver who should have booked on hadnt done so and the Duty Manager asked if I was prepared to start early to cover the duty, which I was. He asked me to cover the whole duty (which was due to finish at about 2130) and that it would be job and finish - that is when Id done it, I was free to go. So Id be cutting away over two hours early - very nice. In addition hed pay me two hours overtime for the fact that Id started before my appointed time, helped him out and prevented a train being cancelled. Whilst that seems generous (which - for me - it is), in terms of the money saved by not cancelling the train, it was insignificant. So for the sake of a bit of co-operation I finished over two hours early and got two hours overtime as well. Not all my colleagues will help out like this, however, but they are within their rights not to start before their due time, so this is a personal thing. Of course, there are other duties that book on and off at different times of the day, some of which may involve some (or all) of the above, and some that just involve running the trains in service. Night duties also come up occasionally. Again there are running and spare turns at night. These mostly deal with the very last and first trains and can, if required, run during the night as required, for example if there are snow falls and sleet working is required to keep running and current rails clear. On our roster, nights occur about every thirty-eight weeks. Personally I try to avoid them and will exchange duties with someone who does like them and there are quite a few who do. But all are slightly different. Some are considered rough (long and hard) or snips (short and sweet!). But the basic idea is that over a two-week period you should be booked on for about seventy-six hours. So there it is - a few examples that I hope will give some insight into a drivers day.